As is his tradition every June, Derrick begged us not to buy him anything for Father’s Day. This year, we finally decided to apease him. So for Fathers Day 2013, it was all about the gullet. And it was geeoood. 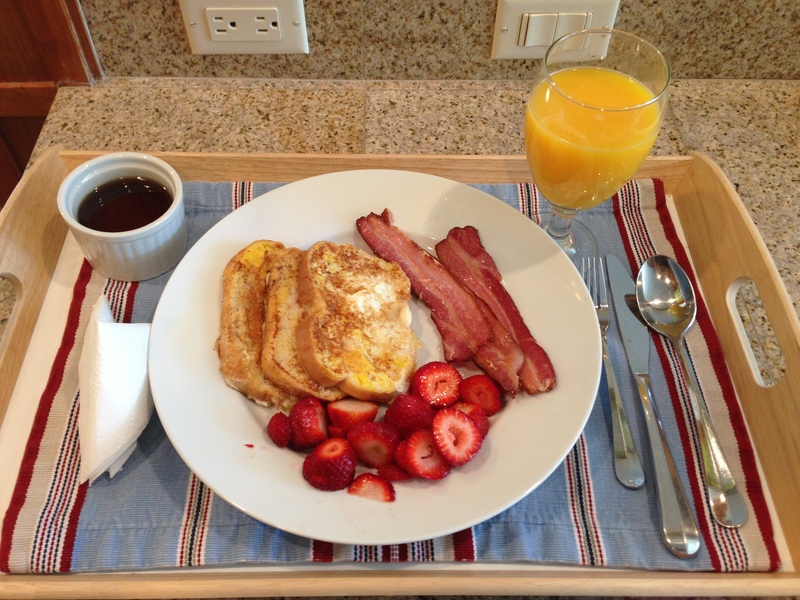 We started with breakfast in bed, courtesy Ethan and Mom. That was some killer french toast Ethan dipped and flipped, if we do say so ourselves. And he folded that upright napkin by himself. Honest. 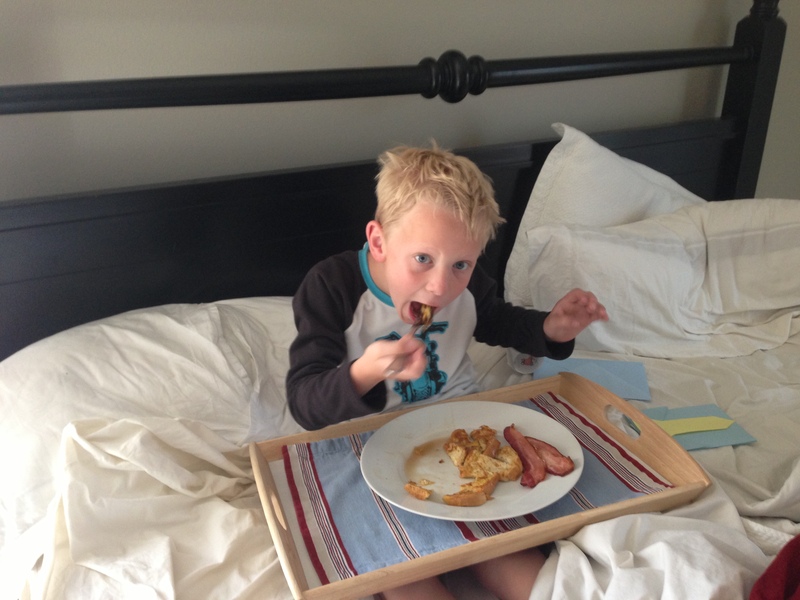 Watching his father eat, Ethan decided that “breakfast in bed is cool,” and asked for a turn. 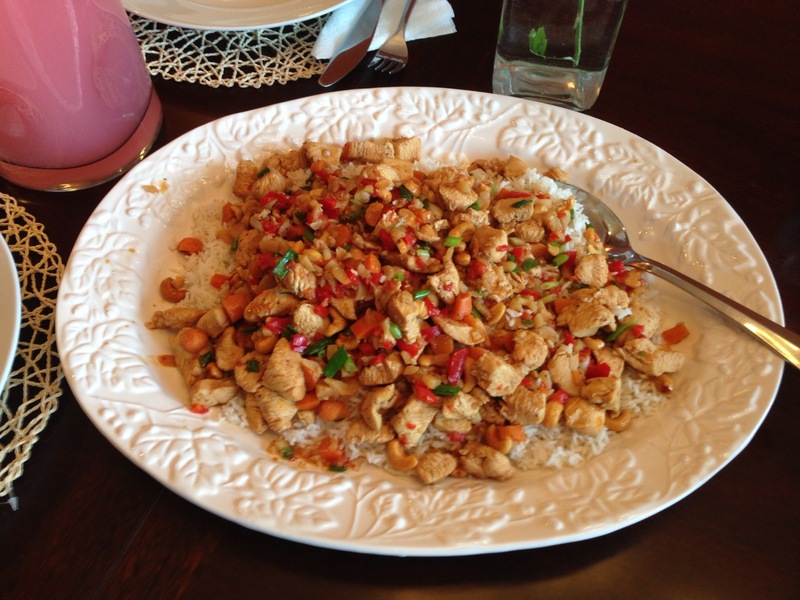 Rachael wanted to make dinner for Dad as her gift, so after church she whipped up some Thai Cashew Chicken. Talk about geeood. And no, my friends, that is not the main dish! 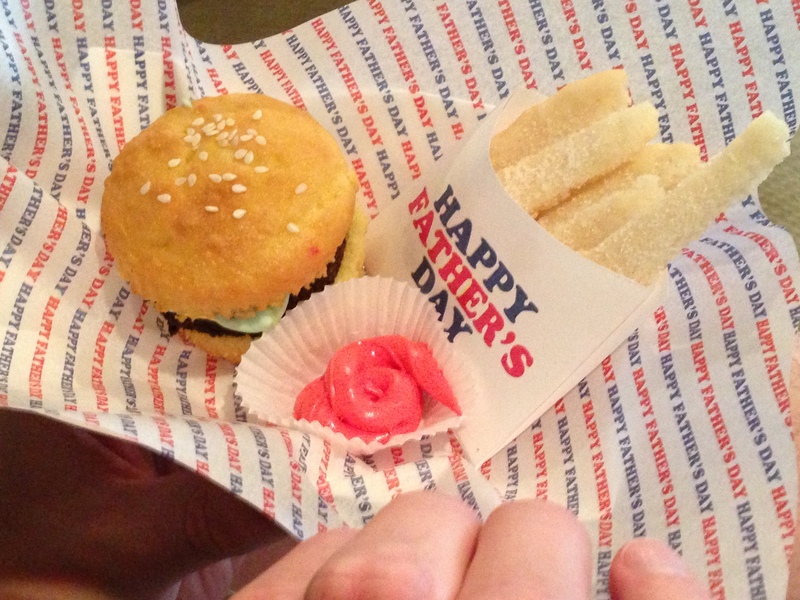 It is a cupcake-brownie “burger” with frosting “lettuce” and “mustard”; sugar cookie “fries” with pink frosting “ketchup”, and tracing paper on which she printed a design to create the look of a restaurant wrapper. She did the entire thing by herself (I only purchased ingredients) and it came out just like the photo on Pinterest. We were seriously impressed. And it tasted delicious–moist, sweet, and yummy. This wasn’t just a peacock dessert that looked good. It was good. Or should I say: geeoood. 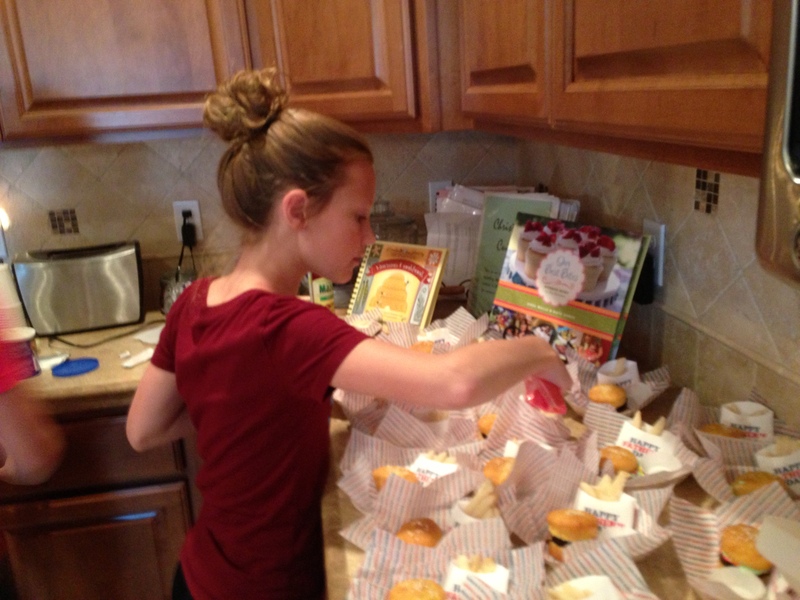 Meg worked all day Saturday on her surprise. All. Day. Father was happy with the spoils, but we cannot decide if his reaction (see freaky smile above) was reward or punishment for our efforts. Charming or creepy–what do you say? 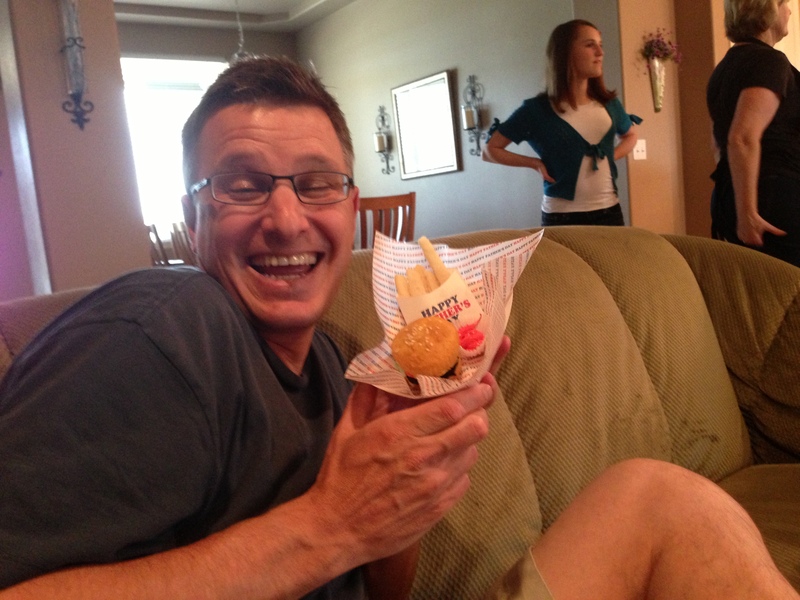 Here’s what we say: Happy Father’s Day to the most charming, creepy, brilliant and ridiculous man we all love. Thank you for being the silly to our serious and the frosting to our fries. We love you a million cheeseburgers. and p.s. I didn’t even plan this, but look to the far right of this photo for bonus footage from Grandma Cindy. Wow. That combined with Derrick’s expression qualifies this for my next facebook cover photo. You can’t make this stuff up. Previous Article Dr. Oz comes to Washington. Next Article 13 laughs for Friday.